The Q-STEP Inuit training and employment project launched by QIA is a partnership with Baffinland Iron Mines, with support form governments of Canada and Nunavut, and Kakivak Association. Pictured is trainee Issaccie Qanatsiak. The Qikiqtani Inuit Association (QIA) is leading the Qikiqtani Skills & Training for Employment Partnership (Q-STEP) project. 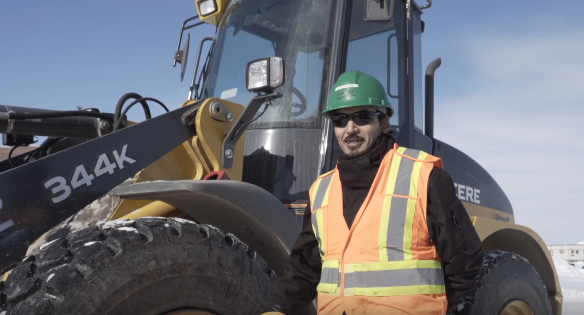 Q-STEP is a new Inuit training and employment project launched by QIA in partnership with Baffinland Iron Mines with support from the Government of Canada, Kakivak Association, and the Government of Nunavut. The project will run from 2017 to 2021 with an emphasis on delivering training to unemployed Inuit, with a focus on Inuit women and youth aged 18 to 30. Through Q-STEP, Inuit will gain qualifications and transferable skills to enable them to take advantage of current and future employment opportunities. The overarching goal of Q-STEP is to increase Inuit employability. To learn more, please see the following Q-STEP videos. Q-STEP trainee Issaccie Qanatsiak video in Inuktitut or English. Q-STEP trainee Joamie Oqallak video in Inuktitut or English. Click here for video featuring a group of the Q-STEP trainees participating in a heavy equipment training course.